The Retail Connection executive has found new fun and friends with the ElliptiGO. Steve Lieberman, CEO of The Retail Connection, loves connecting with people, being outdoors, and exercising. So it only made sense that his newfound passion would combine all three. Lieberman discovered the quirky contraption while on vacation with his family in Aspen nearly six years ago. He immediately tracked one down and bought it. Before long, he had two at his home in Dallas, and two more at his vacation home in Colorado, Lieberman’s favorite ElliptiGO destination. Lieberman’s passion grew from there and, one year later, he became the first ElliptiGOer to successfully complete the ride from Independence Pass in Aspen to the Continental Divide in the Rocky Mountains. The roundtrip excursion, which was 42 miles long and included a 4,200-foot climb, scored Lieberman a featured spot on the landing page of the ElliptiGO Olympics’ website. The ElliptiGO, the lovechild of an outdoor bicycle and an indoor elliptical, was first created in 2006 by Solana Beach, Calif., residents Bryan Pate and Brent Teal, two engineers passionate about getting people outdoors and exercising. Pate lost his ability to run in 2005 after suffering from constant knee and hip injuries. He took to the gym to stay active, but quickly realized how much he hated being locked indoors. So he began searching for an outdoor elliptical. Shocked when he discovered such a device didn’t exist, Pate contacted Teal, a mechanical engineer who assured him that his vision could be materialized. After creating five prototypes, the duo took a leap of faith, quitting their jobs and investing all their time and energy into the product. In February of 2010, the pair delivered the first ElliptiGO to a customer in San Francisco. Since then, the Solano Beach, Calif.-based company has grown globally, with more than 15,000 customers. 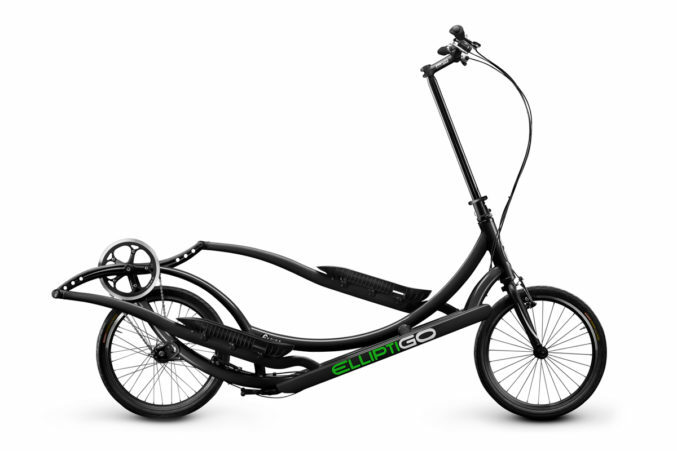 ElliptiGO now has four different models, each one offering more customizable options. The base model starts at $1,299, with the top-of-the-line ElliptiGO costing $3,499. Having a playful nature is at the heart of Lieberman’s life. In fact, Lieberman says the key to a happy and successful life is “making everything play and not work. If you’re doing the same thing as the person next to you, and they’re working and you’re playing, who’s going to be more successful?” he asks. For him, the answer is obvious. So obvious that he’s carried this motto into his professional life. As the head of The Retail Connection, which he started in 2003, Lieberman is charged with the private real estate brokerage of 108 employees across offices in Dallas-Fort Worth, Austin, San Antonio, and Houston. The Retail Connection links the retail and real estate industries, providing clients like Bed Bath & Beyond, Nordstrom Rack, and Topgolf brokerage, advisory, and investment and management services. Lieberman even found a way to conduct business while on the ElliptiGO. For example, he hosts meetings and conferences with his business partners, who join him on ElliptiGOs. And keeping his clients active both physically and in business transactions helps foster his relationships. The best part about it? The valuable one-on-one time that lends itself to great brainstorming sessions. The ElliptiGO’s relationship benefits go beyond his business relationships and into his personal life.